In this video, Dr. Malec answers a question submitted by one of our readers. This letter writer wonders how to keep their partner engaged in difficult conversations. Watch the video above for Dr. Malec’s response. It’s important that your partner gets the time and space they need to consider what they have to say. Don’t spring a difficult conversation on them; talk about it in advance and decide together when you will discuss the issue. You may find it helpful to set a timer before a difficult conversation. Give yourselves 20 minutes to talk about this issue. If you don’t find a resolution in this time frame, table the discussion until tomorrow. Instead of thinking of it as an argument, think about this difficult conversation as a brainstorming session. You are trying to solve a relationship problem together. It’s not about blaming or shaming anyone; neither of you is right or wrong. You have a difference of opinion, and it is important to hear those differences out to show respect for each other. During difficult conversations, it can be difficult not to get defensive. If you feel like you are being criticized or disrespected, it’s natural to get defensive. Make a concerted effort not react defensively. If either of you feel overwhelmed, agitated, or angry, you may need to take a break from the conversation and return to it later when you’re calmer. 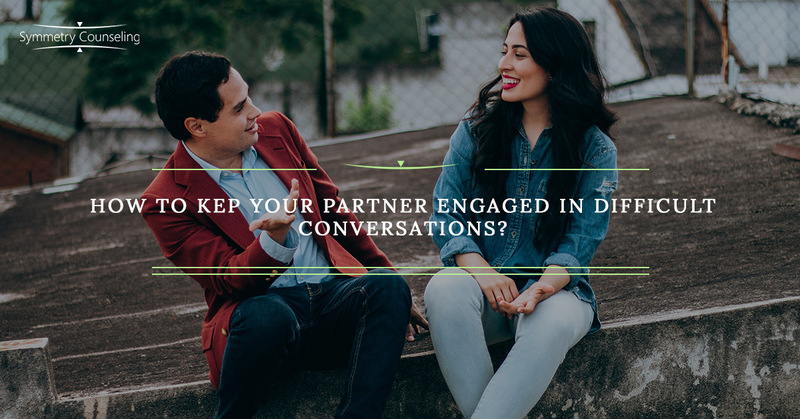 We hope that these tips help you to navigate the important but difficult conversations you must have with your partner. If you feel you could benefit from therapy in Chicago, contact Symmetry Counseling today.